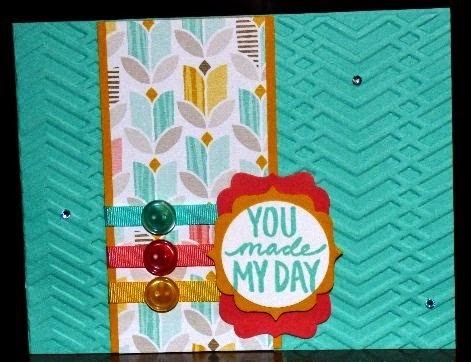 Margie's Crafts: Best Day Ever! Here is a card that you can use for many different occassions! I like to keep these cards on hand so I have them for birthdays, weddings, anniversaries, thinking of you, and the list can go on. This stamp set you can get for FREE during Sale-A-Bration and cannot be bought out of the catalog. What is better than free!?! Card base is your standard 5 1/2" x 4 1/4"
Designer Series Paper 2" x 4 1/4"
Crushed Curry 2 1/4" x 4 1/4"
Run the card base through the embossing folder. Stamp the sentiment in Coastal Cabana onto scrap of Whisper White: punch out with 1 3/8" Circle Punch. Adhere sentiment to Crushed Curry scrap then punch with Label Bracket punch. Punch Calypso Coral with Decorative Label punch. Using a Dimensional, adhere the Crushed Curry sentiment piece to the Calypso Coral. Adhere the DSP (Designer Series Paper) to the Crushed Curry. Wrap one of each of the three ribbons in the Best Year Ever Accessory Pack around the DSP/Crushed Curry piece by running SNAIL adhesive around the back and pressing ribbon onto it in equal distance from one another. Adhere DSP/Crushed Curry/Ribbon piece to card base with the Multipurpose Liquid Glue and let dry. Adhere the sentiment piece to the front of the card wherever you want it to go. Color three rhinestones with a Blendabilities marker and scatter on the card front.